Opened in 2003 and designed by the architect Francisco Javier Mangado, the Baluarte Congress Center and Auditorium of Navarra was built in order to become a meeting point for science, art and culture. It is one of the biggest auditoriums in Spain. It receives its name due to the remains of San Anton’s bastion, which was destroyed at the end of the 19th century. These remains were discovered during the construction of the building. This building is located in the center of Pamplona-Iruña, next to other emblematic buildings such as the Citatel or Navarra’s Parliament. It is a three-floor, modern construction in the shape of an L. From the outside, it is seen as a big, dark-gray granite block. However, on the inside, it turns out to be a heart-warming space with wooden walls that hold three exposition rooms (The Wall, Lower Floor and Mezzanine) and three conference rooms (Gola, Boulevard and Crown). This building also holds two big concert rooms: the Symphony Room or Main Auditorium (1.560 people) and the Chamber Hall (500 people). This architectural work hosts a great number of artists and events every year due to its extensive activity program. The Baluarte Congress Center and Auditorium of Navarra is, therefore, a gathering place that combines the technological necessities of the 21st century and the homelike atmosphere of the center of a welcoming city such as Pamplona-Iruña. Pamplona-Iruña is a center of culture, arts and tradition that echoes internationally. As a mixture of the tradition provided by the Santiago Way and the exhilaration of the international San Fermin festivities, Pamplona-Iruña rises as a city that provides both an ancient and spirited atmosphere for everyone who visits it. Its medieval city walls evoke the great history that the Romans left when they founded it. Since then, this community has been developed, combining the best of ancient and modern times. This five-kilometer construction is one of the best-preserved walls in Spain. Its neoclassical front contrasts with the gothic interior of this cathedral, built in the 14th and 15th century. It is a mandatory stop in the Santiago Way. This building was built in the old center of Pamplona-Iruña, to join the different counties that surrounded it, becoming a symbol of union for the people. This chapel, located in St. Lorenzo’s Church, is a religious meeting point during the San Fermin festivities. This majestic building that rises in the heart of Pamplona-Iruña is decorated with exquisite art such as a portrait of Fernando VII painted by Goya and a great tapestry of the battle of Navas de Tolosa (1212). The Citatel, or New Castle, was built in the 16th and 17th century to provide protection for the city. It has been named World Heritage Site by the UNESCO. These festivities are celebrated from the 6th to the 14th of July. During this time of the year, the city blooms with the red and white colors of the typical outfit of this celebration. People from all over the world come to Pamplona-Iruña to celebrate one of the most recognized events in Spain: the San Fermin festivities. 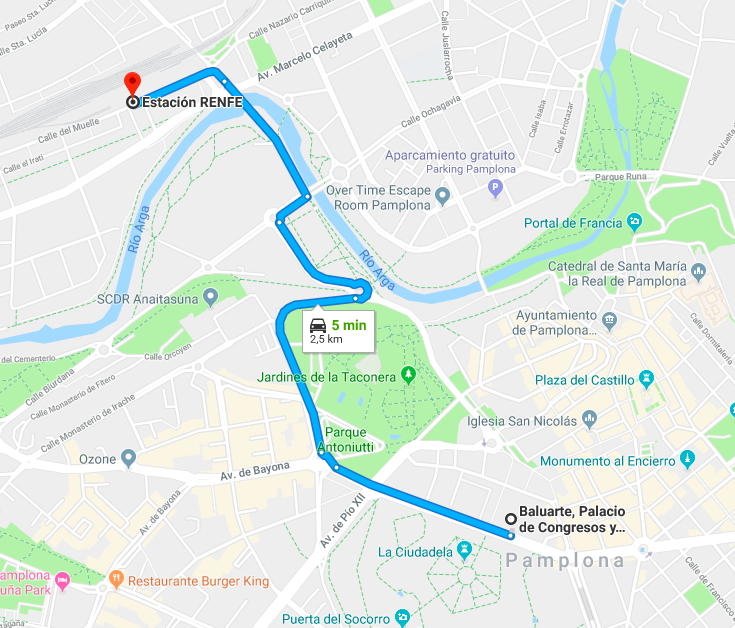 Apart from the most famous bull runs, there are also other activities organized such as processions, bull fights and fireworks, which flood the city with their cheer and liveliness. Each participant to Conecta FICTION has the possibility of arranging travel & accommodation with special fares with the following hotels. Check list of hotels here. IBERIA I.A.E, Preferential Air Carrier of Conecta FICTION 2019, under the agreement reached, will grant a 10% discount to those attending the event. To obtain this discount enter the PROMOTIONAL CODE (please request us the IBERIA PROMO CODE) for online Purchase on www.iberia.com only. Dates trip are valid from 7 days before and 7 days after the dates of celebration of the event. 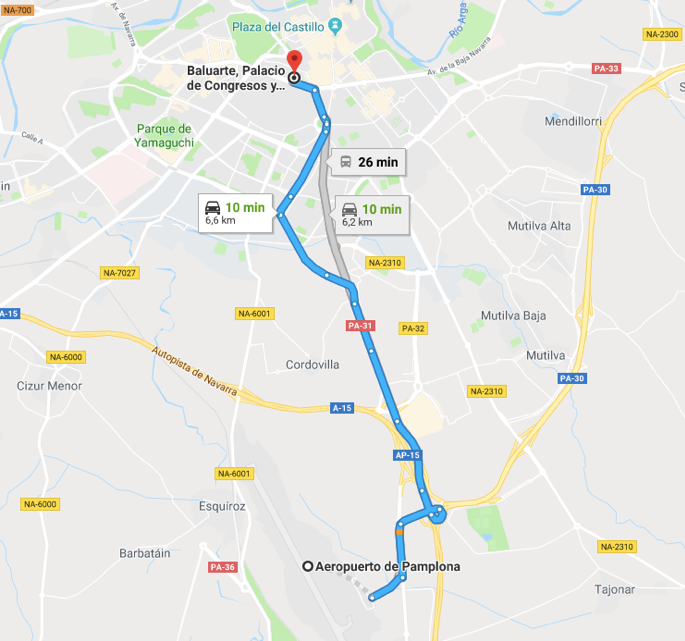 Distance to Baluarte Congress Center and Auditorium of Navarra: 159km, 1h 50′. More info about schedules of both urban and national buses.